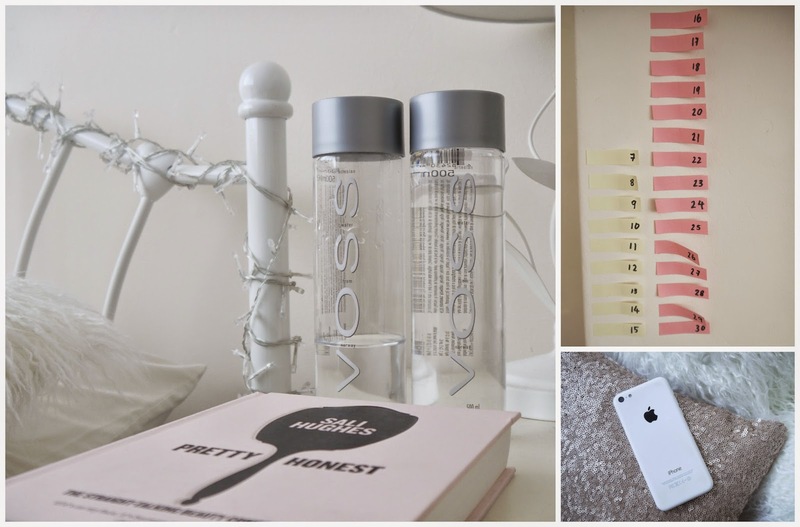 If you read my 2015 post you'll know that it was a goal of mine to drink more water this year. Three months in, I'm still keeping it up. I've noticed a few things that helped me to remember to drink more water and mixed them with Pinterest ideas to form a few tips. As odd as it may sound, a pretty bottle to drink from is the easiest way to get motivated to drink. I got two VOSS bottles from Amazon that are just slightly nicer than your average supermarket bottle or a glass. You can also take them around with you everywhere you go and count your intake in 500ml portions. I saw on Pinterest the idea of creating habits through counting. It can take 30 days to form a habit, so drink water for those 30 days and count them as you go. Simple sticky notes on your wall numbered with a marker can be an easy way to keep track. After those days are up, it should be more of a habit to drink lots of water every day. I'm sure there are many apps of the sort, but iDrated is a free and useful app to track your water intake. You set your own target and put your measurements in as you go, with reminders popping up if you go too long without a drink. If you reach your target or get close in the day, you get medals that show on the page. There's a graph to show your average intakes for the week and you can look back at the months to see your progress. If you're not sure on your target, you can simply put in your weight etc and have it calculate for you. Do you have any tips for drinking more water?